Apple has reigned over the business segment of the market for so long now that other manufacturers would really like to take a piece of the pie, but struggle to do so. It’s a difficult job to overtake a company like Apple after all. 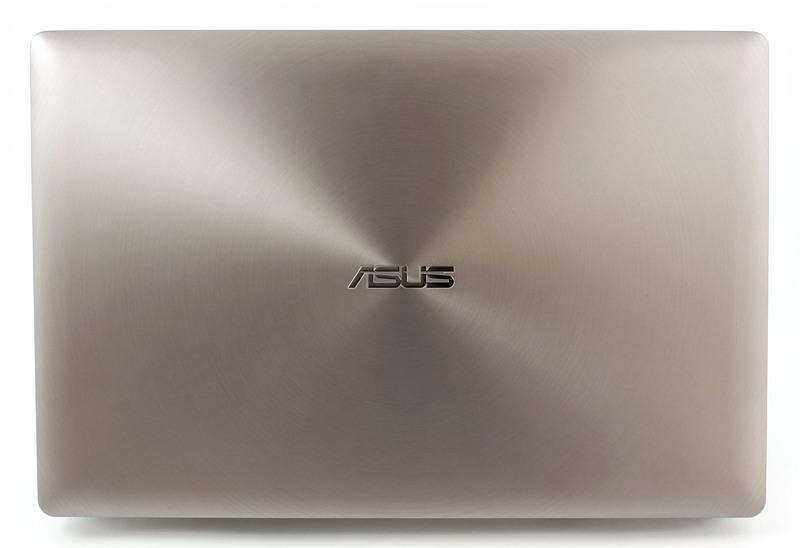 However, ASUS seems to be getting the idea with the new ZenBook Pro UX501 that strongly resembles the MacBook Pro, but keeps its roots to the ASUS’ design language. Actually, its roots are so deep that the device can be easily mistaken for the G501 with the main difference being the color and general appearance. Spec-wise, the notebook doesn’t differ a lot from its gaming brother G501 – Intel Core i7-4720HQ CPU, GeForce GTX 960M GPU, M.2 SSD along with bigger 2.5″ HDD. Sound familiar doesn’t it? Nonetheless, we are keen to check how the machine handles our usual tests and if there’s any difference between the two machines we will be one of the first to know. Oh, we almost forgot about the stunning 4K screen that’s present in the current model. Sadly, more pixels doesn’t mean better image quality in some cases and to check how that goes for the UX501, the notebook undergoes series of display tests that you can read all about in our review below. 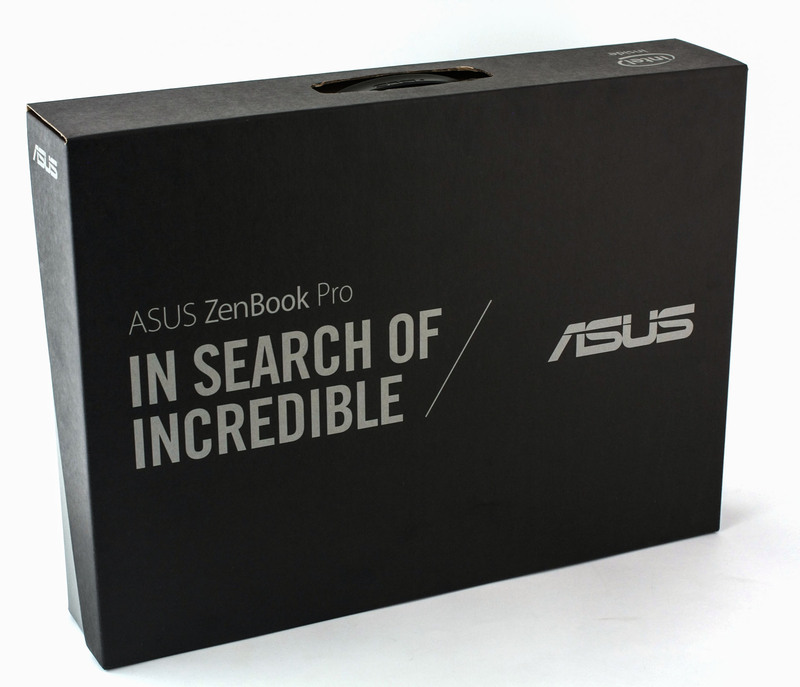 We are again presented with an accessory-rich box that ships with the notebook – typically for ASUS. 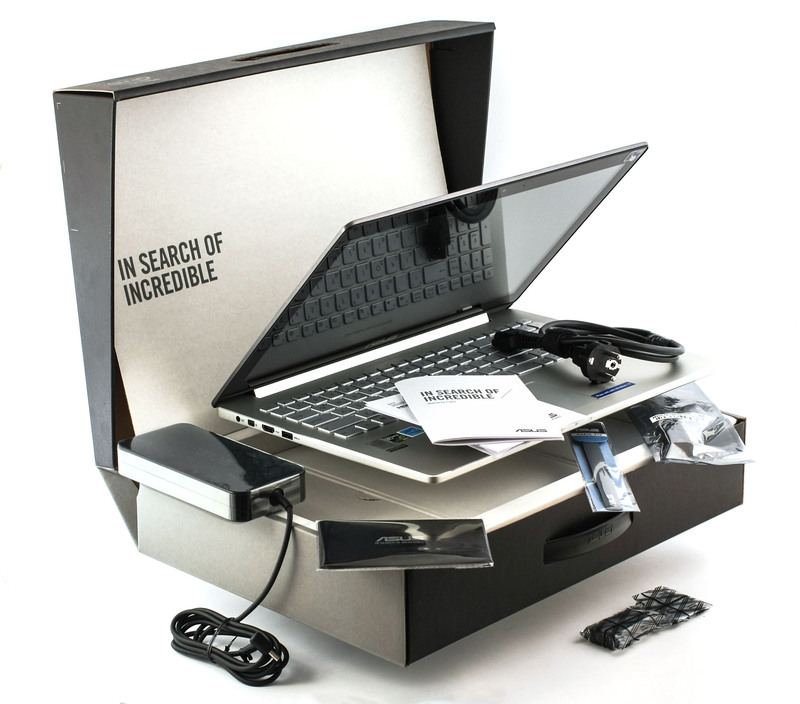 Besides the DVD with drivers, AC adapter and cable, and user manuals, you can take advantage of a cleaning cloth, cable tie, HDMI to VGA adapter, and USB to RJ45 (LAN) port as the notebook doesn’t have one of its own. 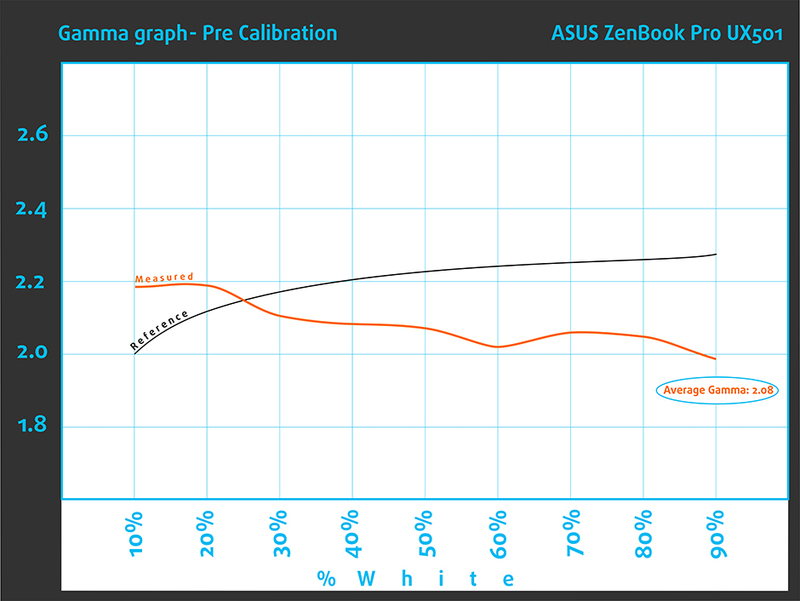 Тhe new ZenBook Pro UX501 is a cool mixture of ASUS’ Zen design language with a little hinge on the MacBook Pro and yet stays true to its gaming sibling ASUS ROG G501. Practically the chassis is the same but features different paint resulting in a totally different appearance. If not for the specs sheet, you’d easily say this is a business flagship with a super-detailed screen, but this is far from the truth. However, let’s start with the lid as usual. 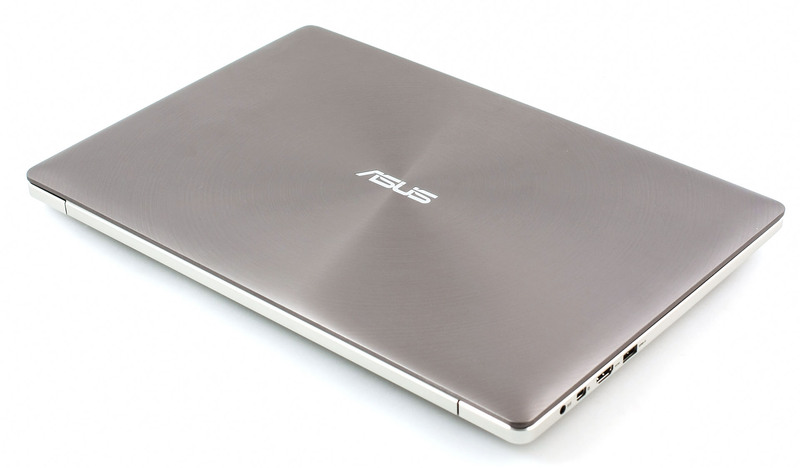 The panel is fully aluminum with ASUS’ logo in the middle and the material is brushed in the iconic concentric-circle pitch. Also, we’ve got good news about the stability of the back side of the lid – it doesn’t bend as much even under big pressure. It will surely sustain bigger weight on top. Going around the other side of the lid you will find the usual microphone, webcam and a bit distractingly big bezels around the UHD screen. The side bezels aren’t that big actually, but the top and bottom stand out and this might be due to some design limitations – it’s a really thin notebook with a lot of hardware crammed inside after all. 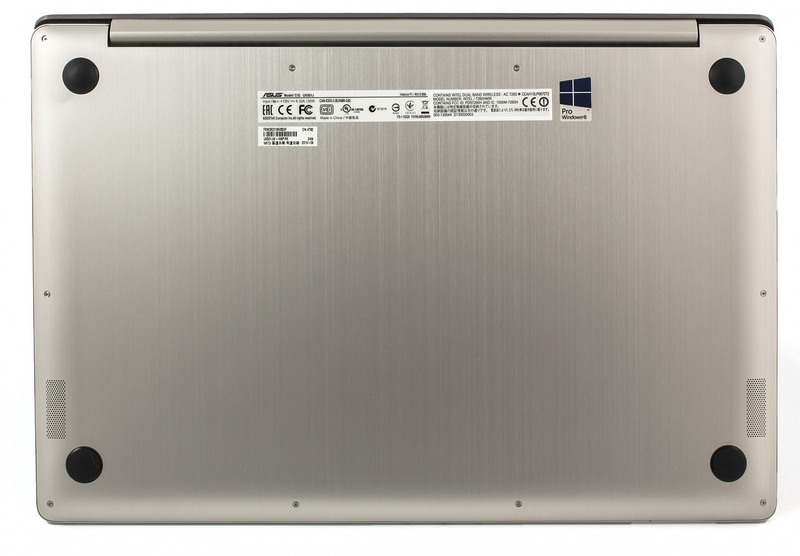 The bottom part follows the all-aluminum design with an easily removable metal panel. Fortunately, the bottom piece doesn’t imitate a real aluminum like other notebooks (Dell Inspiron 7548), but instead features a real lone. On the other hand, we’ve got the strange feeling that something is missing and it’s the exhaust vents. It would have been a good finishing touch if ASUS added a few extra grills that can be effectively used with an external cooling pad instead of relying just on the vents placed in front of the hinge. 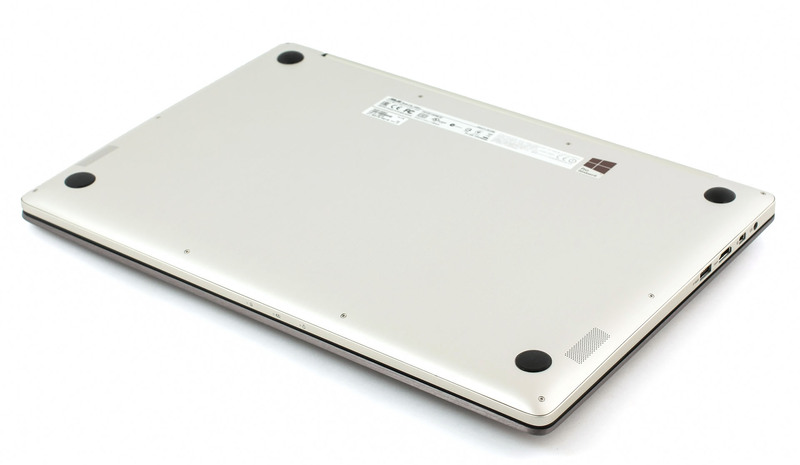 We saw similar design solution in the Lenovo Y50 and we weren’t very happy with the efficiency of the cooling system. We hope the same problems will not occur with the UX501. If you take a look at the sides of the machine you can easily say it’s a MacBook Pro, but the chamfered edges will give it out. Which, by the way, are a nifty finishing touch that we also liked about G501’s design. Furthermore, the super-thin profile of just 20.61 (0.81″) houses all the ports and connections you’d need. The left side has the DC charging slot, Thunderbolt port next to it, full-sized HDMI and one USB 3.0. The right side accommodates only one 3.5 mm jack, SD card reader, and two USB 3.0 ports. Keep in mind that the Thunderbolt port is only available on selected markets. And we are left with the back side of the notebook that has a long grill placed right in front of the screen hinge. Opening the lid will reveal the same flawless build quality as we witnessed on the outside with a small difference in the material. While this doesn’t detract much from the overall sturdiness it is quite noticeable to touch. 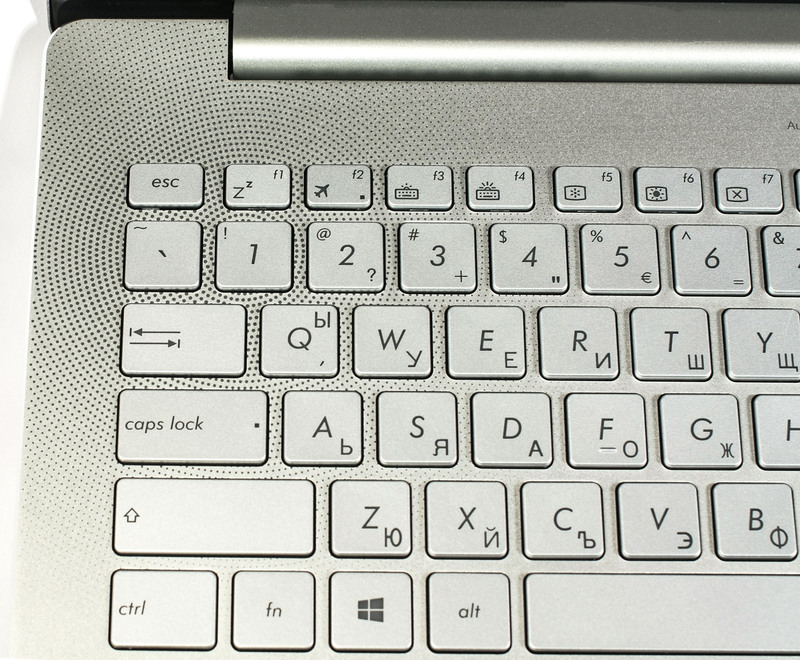 The keyboard bends a little when force is applied, but it’s nowhere near the amount of pressure a normal user would exercise. Still, for the price an aluminum piece would have been appreciated. Moving on with the actual keyboard and touchpad usability. The keyboard is the usual one we find in most ASUS models – long key travel, evenly separated keys, big keys and three levels of LED illumination. All of them combined assure comfortable work in various environments for long periods of time. 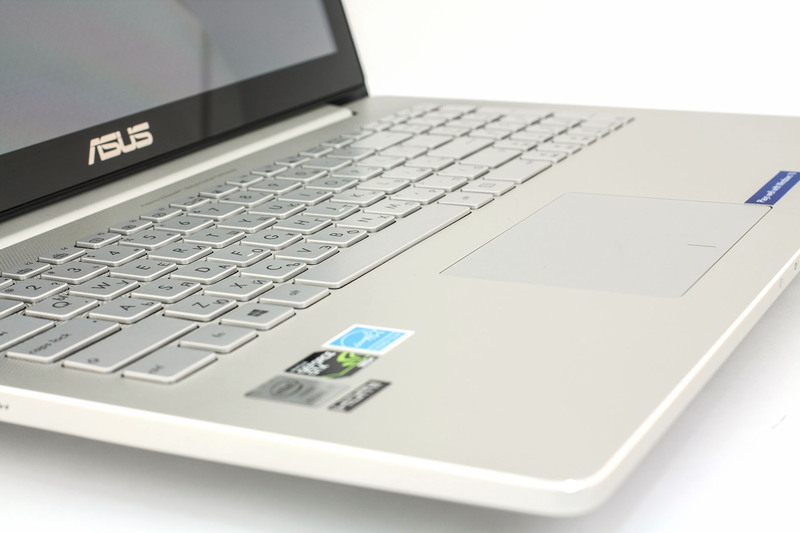 The same goes for the touchpad – it’s easy to use, comfortable, fast and responsive. Only the lower left corner registers right click while the other part of the surface will record a right mouse click. Also, no wobbling effect. All of these useful properties and features make the touchpad one of the best we’ve used so far. There’s nothing really not to like about the input devices of the UX501. For a premium notebook the UX501 is, we expected excellent build quality, premium materials, and responsive and comfortable input devices. And that’s what we got. The overall design and build quality is just flawless with little to ask for. 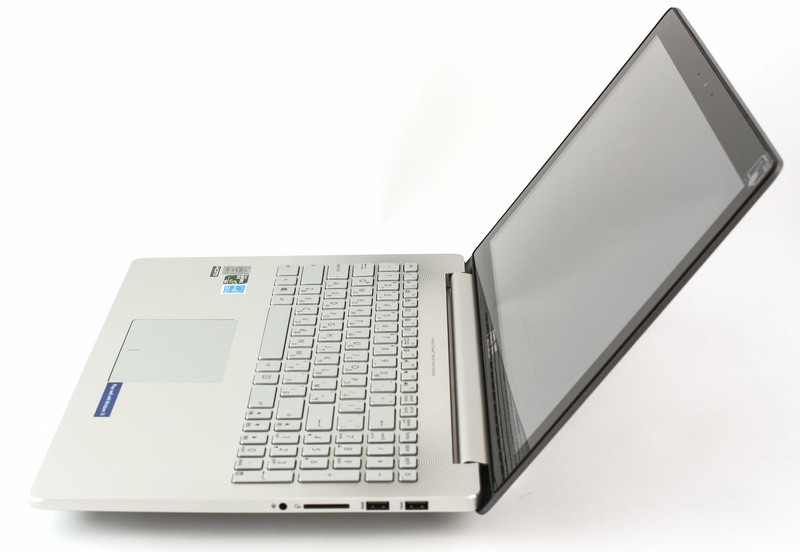 For example, the hinges aren’t tight enough when the notebook is opened leading to a wobbling effect when using the touchscreen and at the same time the hinge is overtighten when the lid is closed and practically can’t be opened with one hand. Quite frustrating to be honest. The ZenBook UX501 features 4K UHD multi-touch screen with IPS (PLS) panel manufactured by Samsung with model number FL156FL02. It measures 15.6″ with 3840 x 2160 resolution leading to a 282 PPI pixel density and 0.09 x 0.09 pixel pitch. The screen can be considered retina when viewed from distance equal to or greater than 30 cm. Viewing angles from 45 degrees are great without any image distortion. The maximum brightness UX501’s panel could achieve is 280 cd/m2 with a deviation of only 10%. This will be good enough for use in really bright rooms, but not outdoors as the reflective glossy finish doesn’t help the situation. The average color temperature on the surface is 6800K – a bit colder than the optimal one of 6500K (D65). To put things into perspective, we would like to give you a little introduction of the sRGB color gamut and the Adobe RGB. Starting with the CIE 1976 Uniform Chromaticity Diagram that represents the visible specter of colors by the human eye giving you a better perception of the color gamut coverage and the color accuracy. Inside the black triangle, you will see the standard color gamut (sRGB) that has been used by millions of people in HDTV and the Web. As for the Adobe RGB, this is used by professional cameras, monitors and etc. used for printing. Basically, colors inside the black triangle are used by everyone and this is the essential part of the color quality and color accuracy. 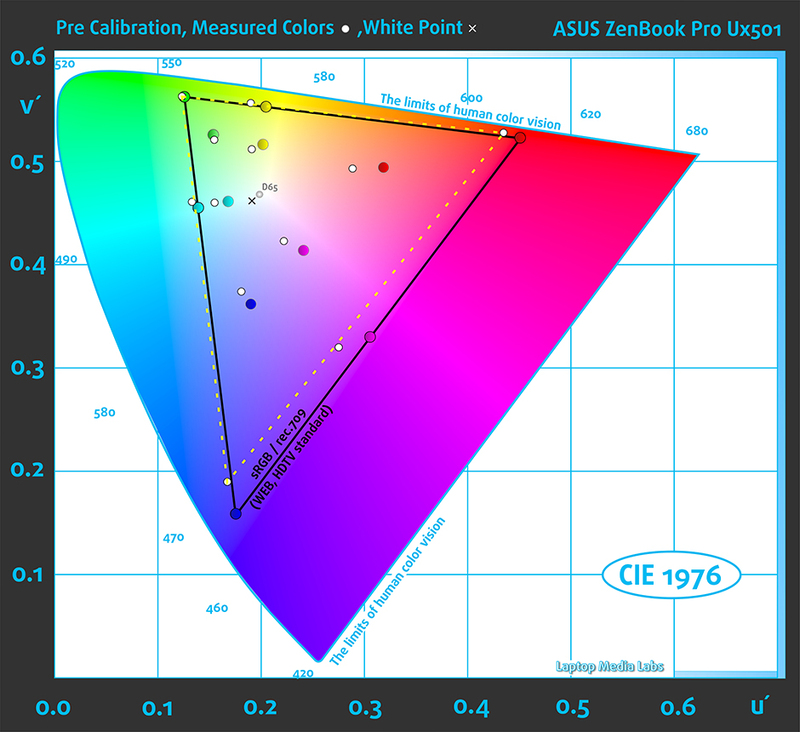 The yellow triangle represents the UX501’s panel color gamut coverage and in this case it’s 90% of the sRGB and 71% of the Adobe RGB. The image below is practically the same but with the recorded results – the one on the left before calibration and the one on the right after. Color circles represent the reference colors and white circles being the result. 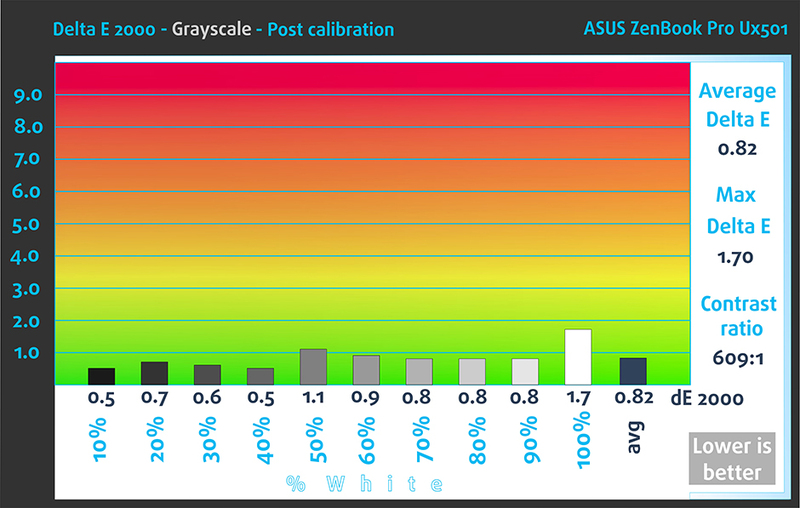 You can see mainly additional colors with 100% and 50% saturation inside the sRGB gamut. Blue and red colors with 100% saturation are inaccurate due to the absence of a significant number of colors. We tuned the display at 140 cd/m2 brightness and 6500K color temperature. 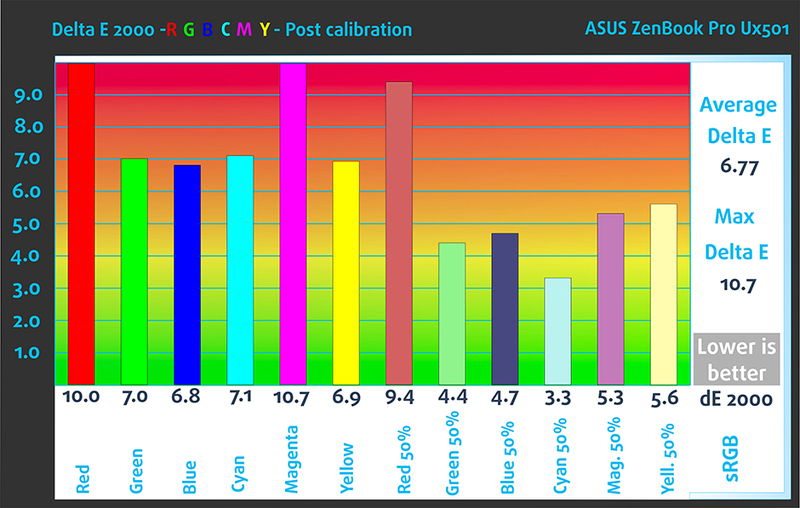 For the calibration we used X-Rite i1Display Pro and we measured the color accuracy before and after calibration. It turns out that no calibration is needed for normal usage, but little must be done for designing, photo and video editing. In this case, the 10% of the sRGB that isn’t covered will matter. With the help of 24 commonly used colors we checked the color accuracy of the panel. Colors that we used represent skin tone, grass, blue sky, orange and etc. The average DeltaE 2000=6.16. Lower score is desirable. No major screen flickering issues were detected. PWM occurs only under 25% screen brightness in which range the screen is practically unusable unless you are in a really dark room or environment. Even then, the frequency of the emitted light is 1.35 kHz which is high enough for non-problematic usage after long periods of time. Our conclusion is that the notebook’s display is user-friendly and will not cause any discomfort during work. We recorded the refresh time of the pixels from black to white and white to black for 10 to 90%. So we were able to measure Fall Time + Rise Time = 21.4 ms. It’s a relatively good result for an IPS panel as they have mostly slower response time compared to the TN panels. 21.4 ms will not be noticed by most gamers, but those who play more precise FPS (first-person shooter) games will experience a bit blurry effect. ASUS ZenBook UX501 features great IPS panel with detailed resolution (3840×2160) and good properties leading to excellent image quality. Viewing angles are good, the maximum brightness is relatively high, offers wide sRGB color gamut coverage and acceptable contrast. Moreover, the panel has PWM (screen flickering) only between 0 and 25% brightness in which state the display is virtually unusable, because it’s too dim. This means the screen can be used for work or gaming in long periods of time without causing eye fatigue. Unfortunately, the color accuracy seems a bit off. Don’t get us wrong, it will do just fine for normal browsing, gaming and working, but it will not be suitable for design-related activities or professional photo editing for example. Exceptional sound quality is at hand. Even under subjective hearing the loudspeakers sound really good with clear highs and full lows. It’s not a surprise, given the fact that the speakers are made by Bang & Olufsen. 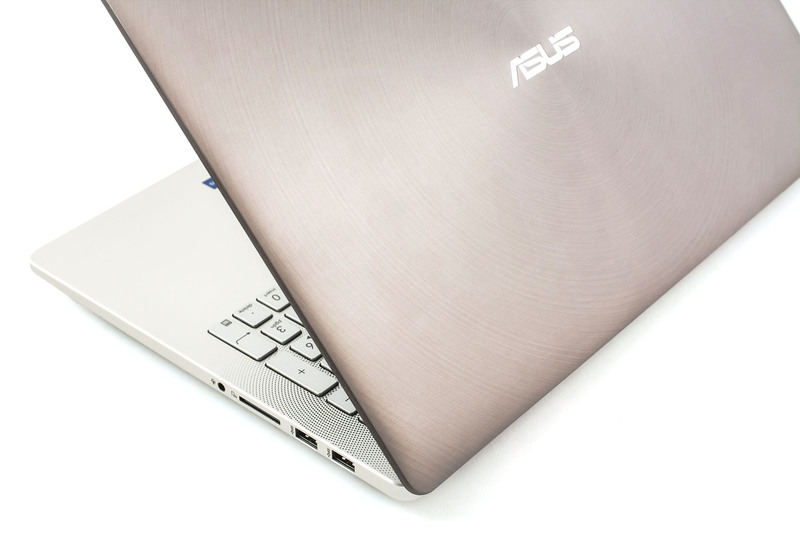 ASUS ZenBook Pro UX501’s battery holds a really big charge and while ASUS is certain that the notebook will last for at least 6 hours of web browsing and video playback, we suspect this will not be the case. 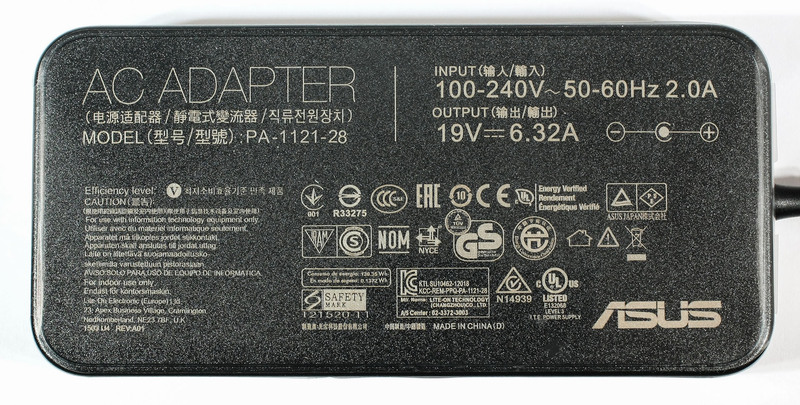 The battery here is the same we saw in the G501 – manufactured by ASUSTeK with model number N501-39 and rated at 60Wh. Also, there’s a configuration featuring 96Wh battery that will surely make a huge impact on the battery life. We ran the usual Wi-Fi browsing, video playback and gaming tests with the same conditions as usual – Wi-Fi turned on, Bluetooth off, power saver turned on and screen brightness set to 120 cd/m2. If we consider this machine as a gaming notebook, the result seems to be okay – 200 minutes (3 hours and 20 minutes). Slightly lower result and as it seems the 4K screen is draining the battery like hell – 158 minutes (2 hours and 38 minutes). Although, the Intel Core i7-4720HQ has been launched in Q1 2015, this CPU is not part of the new Broadwell generation, but it represents the older one – Haswell. 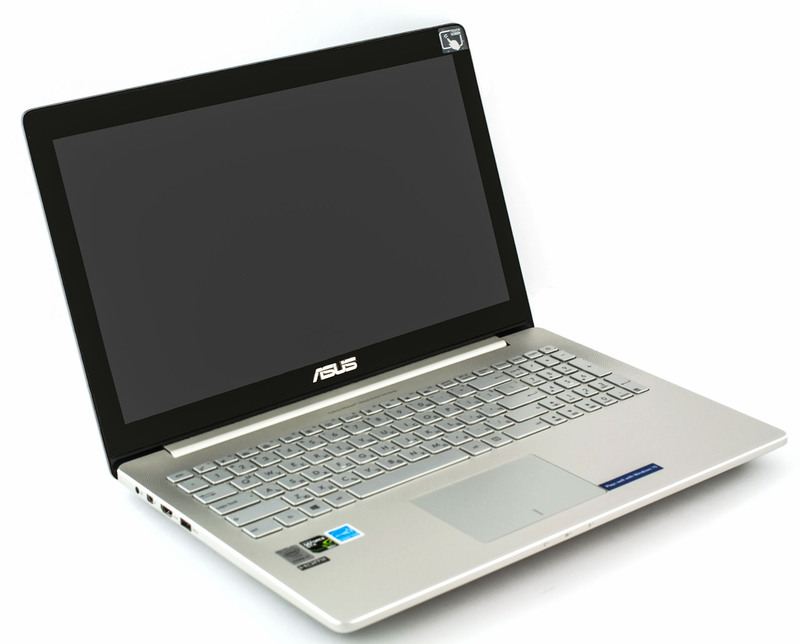 It’s a direct successor to the Intel Core i7-4710HQ and aims to replace it in 2015’s gaming notebooks. Basically, the biggest difference between the Core i7-4710HQ and i7-4720HQ is that the newer version has a slightly bigger base and turbo clocks (100MHz). That being said, the Core i7-4720HQ has a base frequency of 2.6GHz and Turbo Boost up to 3.6GHz for one active core, 3.5GHz for two and 3.4GHz for four active cores. The manufacturing process is the same as the whole Haswell family CPUs – 22nm. This CPU, as every high and mid-range CPU from Intel, supports the so-called HyperThreading technology, that emulates one virtual core for each physical one. So we have 4 cores with a maximum of 8 running threads at the same time. It supports dual memory channel of DDR3(L) 1333/1600MHz and up to 32GB. The chip also integrates the Intel HD Graphic 4600 that has a base clock of 400 and Turbo Boost up to 1200MHz with 20 EU (Execution Units). The maximum TDP of the whole chip is 47W which makes it more suitable for 15-inch laptops or bigger, which are mainly for gaming. Fritz is a chess benchmark which tests the computing capabilities of the CPU with various chess moves. 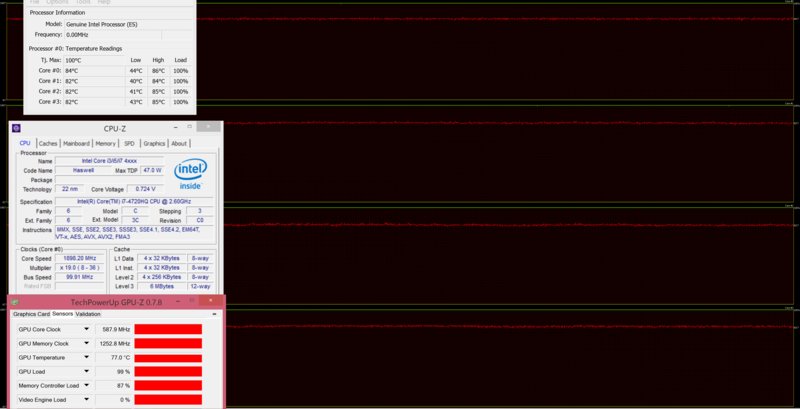 The Intel Core i7-4720HQ managed to get 12.493 million moves per second. For comparison, one of the most powerful PCs, Deep(er) Blue, was able to squeeze out 200 million moves per second. In 1997 Deep(er) Blue even beat the famous Garry Kasparov with 3.5 to 2.5. The GeForce GTX 960M (2GB GDDR5) is placed as a high-end graphics card, but used mostly in budget gaming laptops. It is part of the Maxwell family of GPUs. It features 640 CUDA cores or simply – shading units, along with 32 ROPs and 53 texture units. It has 2GB of dedicated VRAM and in this case GDDR5 type. The speed bandwidth of the memory is 80.2 GB/s and 128-bit bus width. The GTX 960M uses the same GM107 GPU core that we’ve seen in last year’s 860M, but this one is mainly oriented to bump the notebook’s battery life and add some extra performance, but that’s not stressed as much. However, the GM107 is clocked a bit higher than last year’s model – 1097MHz of base clock and boost up to 1176MHz. It also supports 2048×1536 resolution through VGA port and 3840×2160 with DisplayPort and HDMI. All tests were performed using the latests NVIDIA drivers – 353.30 WHQL. For this test, we use three-step assessment. Firstly, we start off with a CPU stress test, then we run a similar GPU stress test and finally we measure the temperature on the surface of the notebook to see how this affects user experience. Keep in mind, though, that this test does not represent real-life conditions as a normal user will not be able to achieve 100% CPU and GPU load. However, this is a good way to check the overall stability of the system in the long run. Starting with one hour of 100% CPU load that reveals several insights. Under normal state, the CPU runs at 40-44 °C and after an hour the CPU kept a temperature of around 84 °C – a bit high but still far away from the maximum operating temperature of 100 °C. The CPU also ran at around 3.0 GHz fitting into the 2.6 – 3.4 GHz (for 4 active cores) range so we didn’t notice any excessive throttling or any throttling whatsoever. You can see the temperatures represented by the red line and CPU load by the green line on the graph below. 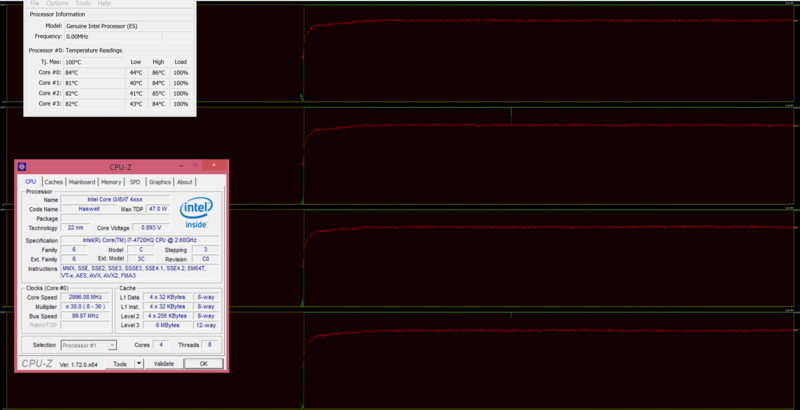 After an hour we ran the GPU stress test along the CPU torture test. The good news is that the CPU’s temperature didn’t rise a bit, but throttling occurred every now and then. The CPU was ticking somewhere between 1.3 GHz and 2.0 GHz, while the GPU was throttling at nearly 600 MHz at 78 °C. This is normal due to the high CPU and GPU load and excessive heat coming from the internals. We hope, however, this doesn’t affect user experience. Despite the high temperatures that the notebook reaches, the area where palms rest remains relatively cool without causing any discomfort while working or gaming. You can see the results on the heat map below. The ASUS ZenBook UX501 is built with excellence with a great choice of materials, design language and above everything else – it’s thin and light. Despite it’s fragile looks, the notebook is sturdy and houses really powerful components suitable for gaming. In addition, the touchpad and keyboard are just flawless without any issues at all. Though, the material used for the making of the interior could have been aluminum as well, because other high-end notebooks like the MacBook Pro have the desired premium feel of the all-aluminum body. At least this doesn’t affect the overall sturdiness of the chassis. The UHD screen is another aspect of the notebook that came by a surprise. Most of the UHD panels on the market are somehow gimmicky, but this one offers exceptional image quality with little to be desired mostly when it comes to color accuracy. On top of that, the Samsung’s panel lacks the so-called screen flickering (PWM) and you can rest assured that it will not cause any visual impairment or headaches if your eyes are more sensitive. However, if you are not happy with the screen, you are presented with two options of connecting an external display – HDMI and Thunderbolt, speaking of which, it’s quite unlikely to come across a Windows notebook with this connection type. 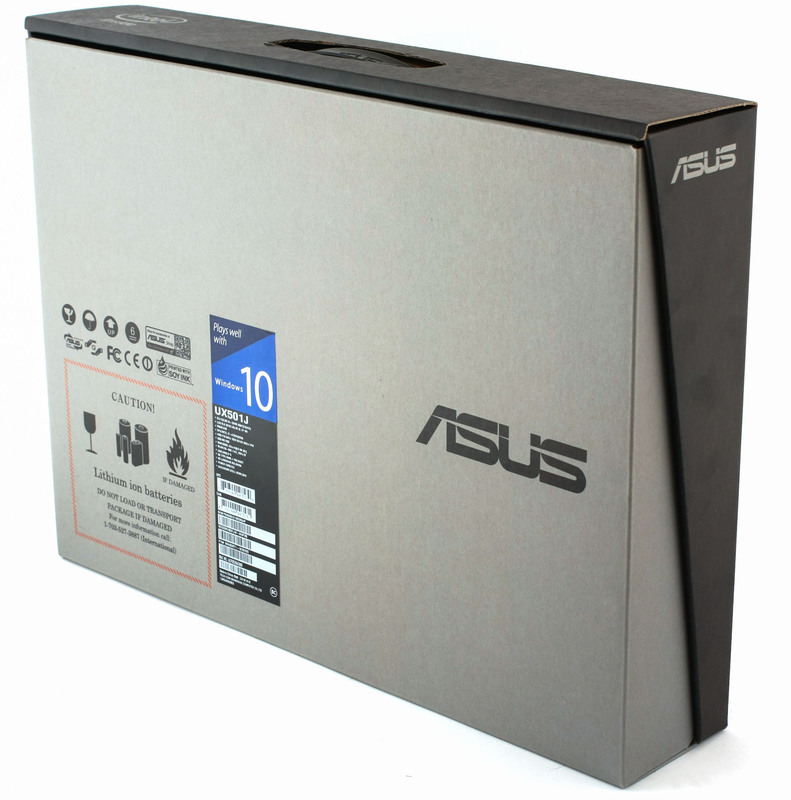 We are thrilled that ASUS has provided an additional high-speed Thunderbolt port. As for the cooling system – it does its job fairly well. There’s some excessive heat coming from the internals, but it will not affect the user experience and the area where palms rest remain cool during high CPU and GPU loads. We would be happy if more manufacturers start to build thin, light, feature-rich and powerful notebooks like the ZenBook UX501 and soon become a standard in the industry. This way more users will have the choice between Windows and Mac notebooks without compromising. Does the yellow on the 4k panel have a mustard color? Many have reported the yellow looks more like mustard. Also, does the screen flicker? Despite it being not PWM on higher brightness many still have reported flickering issues. Will you also kindly post the Samsung screen model number? Forget the model number can’t believe I missed it in the article. Asus is only using the ICEpower amplifier module from Bang & Olufsen and NOT speakers from Bang & Olufsen!